A day to celebrate single moms! 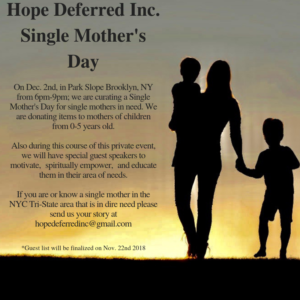 We are curating an event for 10-15 single moms in need. We are donating items and bringing motivation and spiritual empowerment to the lives of these women in need. As a single mother myself, my hope is to uplift and encourage these women on their journey and let them know they are not alone. 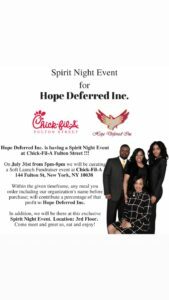 We are excited to announce that Hope Deferred Inc has partnered with Chick Fil A to bring you “Spirit Night”, a major fundraiser event! This will be your opportunity to support our mission, eat, and have a great time. The flyer below contains all the details about our Spirit Night Event. We hope to see you there! So mark your calendars July 31st from 5 pm-8 pm 144 Fulton Street NY, NY 10038. 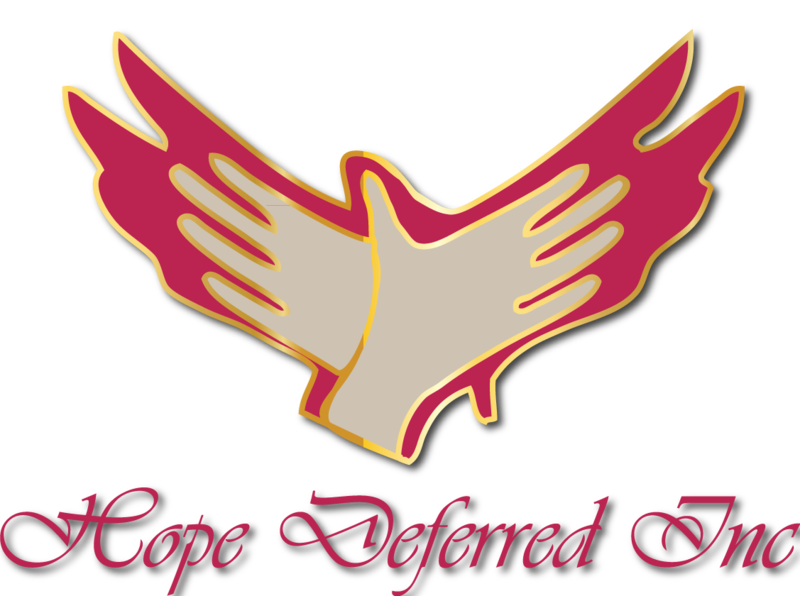 Hope Deferred Inc is back with another fundraiser event! 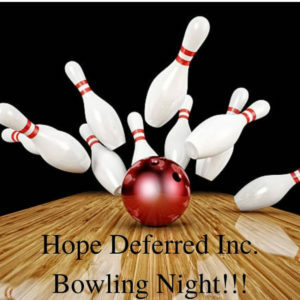 On October 5th, 2018 at 7 pm; Hope Deferred Inc will be curating a Bowling Fundraiser Event at Bowl 360. We are raising more funds for our Single Mother’s Day in November 2018. Tickets are $25 each which includes entry fee, shoes, food, and fountain drinks. Come on out and bowl for a cause.